Today I open with an actual knitting picture. Here is my progress (ahem) on Drama City, the skirt. You can see the 2" band of moss stitch around the wide bottom edge. There is now almost 2" of stockinette done above that. The photo shows the decrease line that I am putting toward the side of each front section (remember it is one piece, button down the middle). I am not sure where the lines will actually hit on the finished skirt; I worked the placement out arithmatically. Four decreases come on every right side row for a while. Because I decreased 68 stitches after knitting the moss stitch band, I am now down from 528 to stitches to 444. I should be finished in no time. Naturally, after bitching and moaning about circular needles, I am forced to use one for this project due to the immense number of stitches. It is the only way, but I am aware of some discomfort in the drag of the stitches over the join and the flex of the cable. The needle I am using is from the Boye set that runs from needles sized 4 to 15, a great range. I like it for that and also because I got it for a very cheap price at Tuesday Morning. If you look back at the photo you might spot that the needles are two different colors. 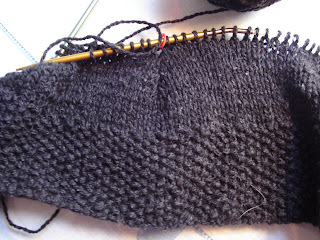 For the past few projects of back and forth stockinette I've been using a smaller needle for the purl side. In this case the sizes are 5 and 4. I just read somewhere that the looseness happens because the purl stitches are wrapped counter clockwise while the knit stitches are wrapped clockwise. Counter clockwise is a longer way around and therefore uses more yarn. I tried changing the wrap of the purl stitches, which was easy enough to do, but it caused the stitches to sit facing the wrong way on the knit side. They had to be knitted through the back. I didn't think it was worth it. I think this method is called something (Eastern Cross?) but I'm not sure. Does anyone know? Silky Wool, as has recently been pointed out by Desi Knitter, has a special quality. It doesn't look that great in the skein or even on the swatch. It's kind of bumpy and rough looking. But knit up it has a rich, velvety texture. Seeing it in moss stitch makes me think that it would have been a perfect choice for the Kim Hargreaves Darcy sweater. So if you're planning to knit that sweater, consider Silky Wool. It is also a good value - between 7 and 8 dollars for 175 meters or 190 yards. Of course, since this is my first time using it, I can't say how it will wear. And best of all, even though it's not all wool, you can spit splice it. I like that. In further knitting news, it looks like my mitten project is off. At a meeting on Friday the staff at the library agreed to the secret santa Christmas gift exchange rather than getting something for everyone. I suppose I could still give them all mittens, which I would like to do, but I think it would look show-offy and not in the secret santa spirit. I can still knit some mittens for other friends and family, but since I will need fewer, I can make them fancier. Since this post is short on photos, I will leave you with some garden pictures. The top pictire is of pansies on my patio. I am into gardening this year. You can tell because I am doing seasonal pots. The bottom photo shows some old fashioned short tulips (Red Riding Hood?) that I planted many years ago and that come and go in my garden. This year, it looks like they've regenerated themselves a bit. The grave of our beloved cat Jane is to the left of the tulips. Interesting idea, knitting the purls wit a smaller needle. My purls as so loose...I might try that. Did you knit your gauge swatch that way?